In 2005, I began an artistic examination on waste, and consumerism. My process begins by exploring the underbelly of cities and suburbs. 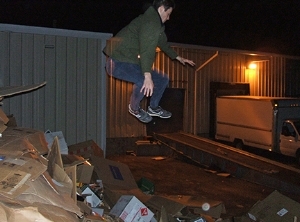 Dumpster diving, collecting objects, and taking photographs. I focus on specific features of affluence, and experiment with ways to use them symbolically. Cardboard coffee sleeves, cul-de-sacs, HUMMERs, Swiffers, discarded cell phones, abandoned shoes, etc. From this I create sculptures, performances, and multi-media installations, often working in collaborations. What began as a critique of my own lifestyle became a means for exploring my community, gaining a broader perspective, and contributing to an imperative dialogue. Gabriel Brown is a visual artist, garbologist, and shoe cobbler from the Pacific Northwest. As a visual artist, Brown has exhibited at the Northwest Museum of Art & Culture, Redline Art Center Denver, Korea National University of the Arts, and throughout community centers and street corners. As a garbologist, Brown studies garbage, hosts workshops, lectures, and enacts satirical street performances. As a cobbler, Brown took his very first job in a shoe repair shop at the age of 15. He slowly learned the skills of the trade, and continues the practice to this day. Brown holds a Master's Degree in Fine Art from Washington State University, and has taught visual arts courses at Washington State University, Kaplan University (online), and Seabury Middle School.